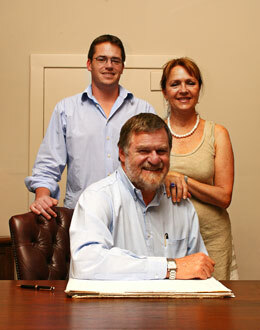 Our family-run shop is located in the centre of Franschhoek and continues the Tracey's Diamonds legacy. With four generations of diamond service and excellence behind our name, we're continually striving to remain leaders in South Africa's diamond industry. Every one of our diamonds bears an internationally-accepted certificate and we ensure that each one is perfectly cut. All of our gold and platinum jewellery is hallmarked. Robert Henry Tracey landed in South Africa in the mid 1890s and started to dig for diamonds in Bakersville near Lichtenburg in 1926. George Arnold Tracey, his son, had become an apprentice diamond polisher at the age of 16 and in 1943 an allocation was granted to him by the central selling organisation, De Beers. In 1966 George was joined by his sons, Robert George and Evan James, who together with their father continued with the allocation until 1981. Following this, each brother went his separate way, with Evan deciding to continue with the cutting and polishing process. Evan has been joined by his son Matthew Tracey who, like Evan, began his apprenticeship in the Tracey's diamond polishing factory. In keeping with their long tradition and reputation, the third and fourth generations of the Tracey family continue to strive for excellence by utilizing only the finest quality stones. Evan's wife, Vicki, works closely with the jewellery manufacturers, designing and creating the beautiful pieces available at Tracey's.